What Is the Difference Between Rolling & Clap Thunder? The loud sound of thunder and the quick flash of lightning is often mesmerizing to young children. Teaching kids how storms occur can help them comprehend what otherwise seems like a fascinating mystery in the sky. Have the kids complete thunder and lightning activities that allow them to learn about Earth's weather and have fun at the same time. Teach kids that thunder and lightning occurs when positively charged electrons are released from the clouds. Using aluminum pie tins and polystyrene foam cups, ask the kids to rub the cups on their heads for a minute. Hair forms a positive charge in this experiment. Rub quickly, but not so hard that the cup is damaged. Set the cup upside-down on the pie tin, and have one of the kids touch the pie pan to feel a small shock. Use this activity to teach kids about storm safety as well. Use a watch or stopwatch to track how far away thunder and lightning take place in the sky, which teaches kids that thunder is the sound of lightning traveling across the sky at five miles per second or at the speed of sound. 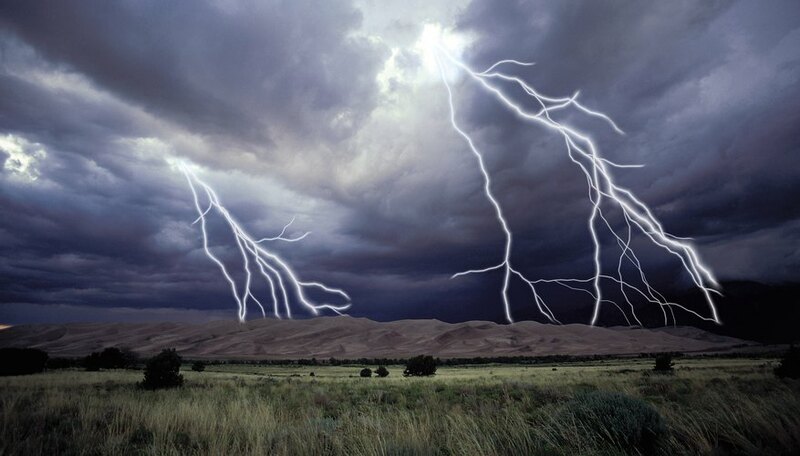 Count how many seconds pass between each clap of thunder and the first flash of lightning; multiply by five to estimate the distance. For example, the thunder is about 15 miles away if three seconds elapse. Have older kids break peppermint or wintergreen mints in their mouths. Ask them to hold up a mirror so they can watch small lightning sparks in their mouths as they break the mints. Turn off all the lights in the room to ensure the sparks are visible. Demonstrate to the kids that breaking the mints slowly with your teeth causes the sugar in your mouth to release small electrical charges into the atmosphere, which attract the oppositely charged nitrogen in the air. Use a balloon and a fluorescent lightbulb to show an imbalance of charged electrons in the sky. Turn off all the lights in the room, and have the kids rub a balloon on their heads for about 15 seconds. Hold the balloon up to a fluorescent bulb to see a flash that resembles a lightning storm. You can have the kids make sound effects for the thunder while conducting this experiment. Corbin, Mary. "Thunder and Lightning Activities for Kids." Sciencing, https://sciencing.com/thunder-lightning-activities-kids-10069023.html. 25 April 2017.